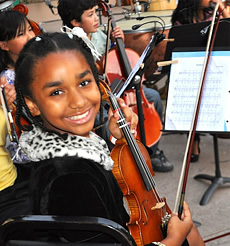 The foundation recently renewed its support for Education Through Music – Los Angeles (ETM-LA) for music education. The program forms long-term relationships with schools that serve low-income children. ETM-LA works with school leaders to create a program for each school based on their needs. After beginning with one school in 2006, the program has expanded to serve ten schools. 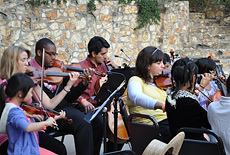 Altogether, the organization provides music instruction to over 4,500 low-income students. Music instruction is provided by qualified teaching artists who receive extensive professional development and on-going mentoring and supervision. Music teachers work closely with classroom teachers in each school to help integrate music instruction into the classroom. Although it is a separate nonprofit organization, the ETM-LA program is based on a teaching model developed by Education Through Music in New York in the early 1990s.